Germany is hardly a country that's synonymous with beaches, which is actually quite a shame since there is such a selection of great beach holiday locations here. Where Germany's sandy strength lies is in its lakeside beaches. These picturesque locations offer a beach holiday with difference: calm waters, majestic surroundings and a whole heap of water sport opportunities. Here are 8 of Germany's best locations for a beach holiday with a difference. Right, let's start you off with a traditional seaside German beach location. When Germans want a bit of sun, sand and (actual) sea then it's to Sylt that they go. 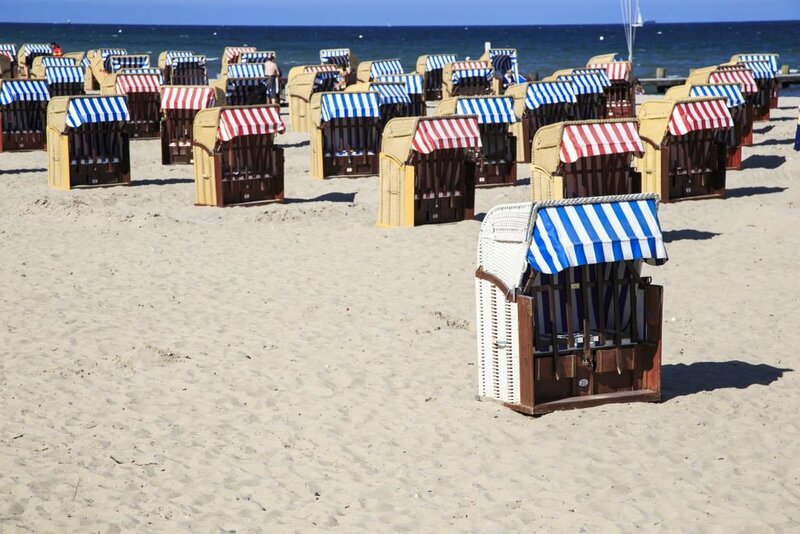 Located on Germany's northern Frisian Islands, Sylt is a beach location with glitz and glam. 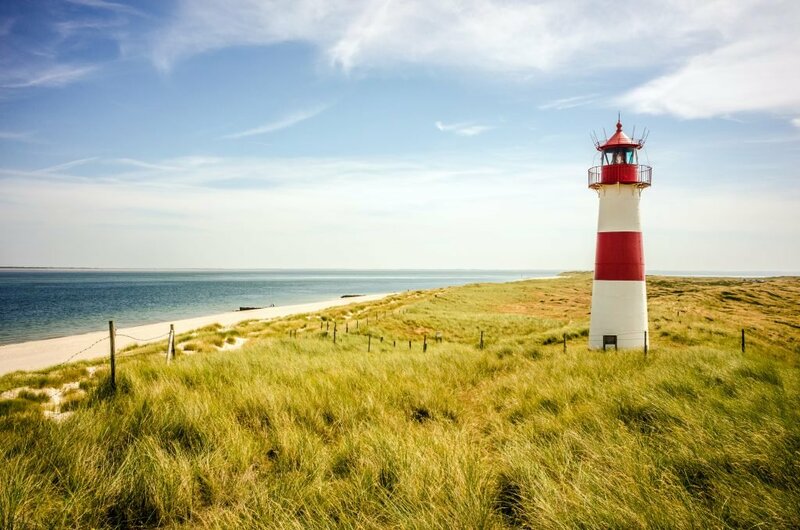 Book into a luxury spa hotel in Sylt (such as Landhaus Stricker), eat in some of the country's best restaurants, enjoy the saunas that dot the coast and perfect your swing at the local Sylt golf club. Oh, and the architecture (cutest thatched cottages you ever did see) is pretty spectacular too. Much like Dover, Rugen is framed by colossal brilliant white cliffs. However, the similarities start to diverge from this point on. Rugen's architecture is decidedly traditional German; although bright it has that gothic, spikey feel. While the Island does draw the crowds in the summer months, it's large enough that you can find a quiet spot all to yourself. Its surrounding lush greenery also makes it a great place for a bit of hiking. Book yourself a Rugen hotel for a bit of sun, sea, sand and serenity. 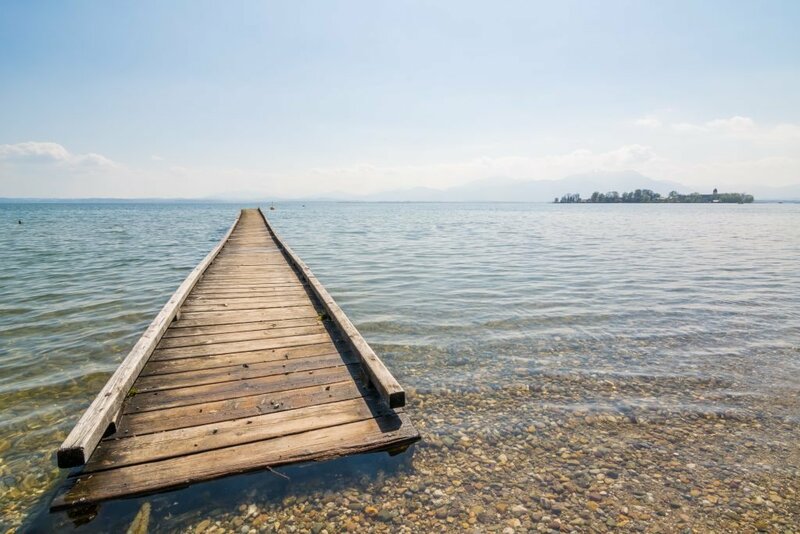 The first of our lakeside beach location picks: Chiemsee is, frankly, fantastic. Affectionately known as the 'Bavarian Sea', at 30 sq miles, this is Bavaria's biggest lake. Not only does it offer calm waters of beautiful blue, its settings are incredible. Hike the woodlands or take a bike ride around the shores of the lake. When you start to feel the sun, take a little dip. Honestly, what could be better than that? For a bit of culture, take a trip out to Herreninsel: a spectacular island that's home to the striking Herrenchiemsee Palace. So where to stay? Well, you have two top options here. 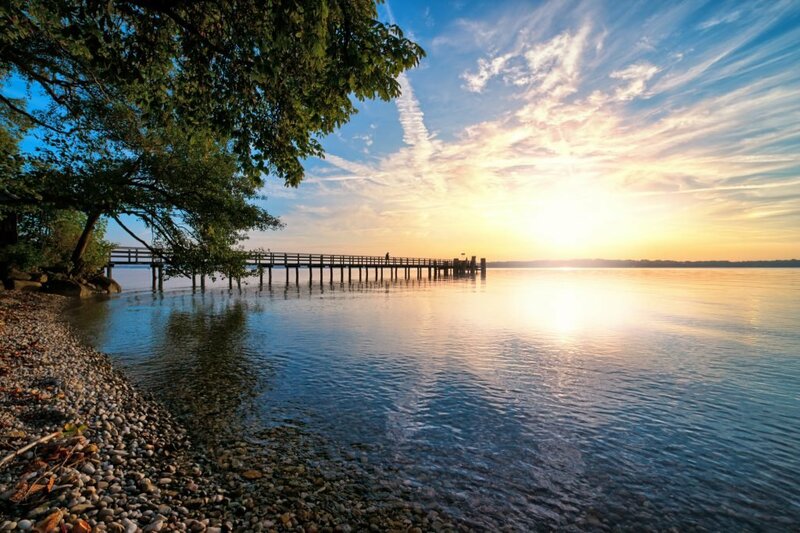 Go for a hotel in Prien am Chiemsee if you're looking for a lively lakeside stay, or pick yourself a Bernau am Chiemsee for a bit of serenity. History buffs of the world, this is the beach location for you. The term 'fairytale-esque' seems to be thrown away all too easily these days, but for Lubeck it's entirely apt - what with it having more than a thousand buildings dating back to the 12th Century an' all. Dubrovnik, eat your heart out. So how does this fit into remit of German beach holidays? Because of Travemunde of course. This popular beach location sits just outside of Lubeck, and the local crowds flock to its 3 miles of coast line, mainly for the spectacular array water sports on offer. Sun, sea, sand and culture. What more could you want? Book yourself a Lubeck hotel or a beach holiday in Travemunde. 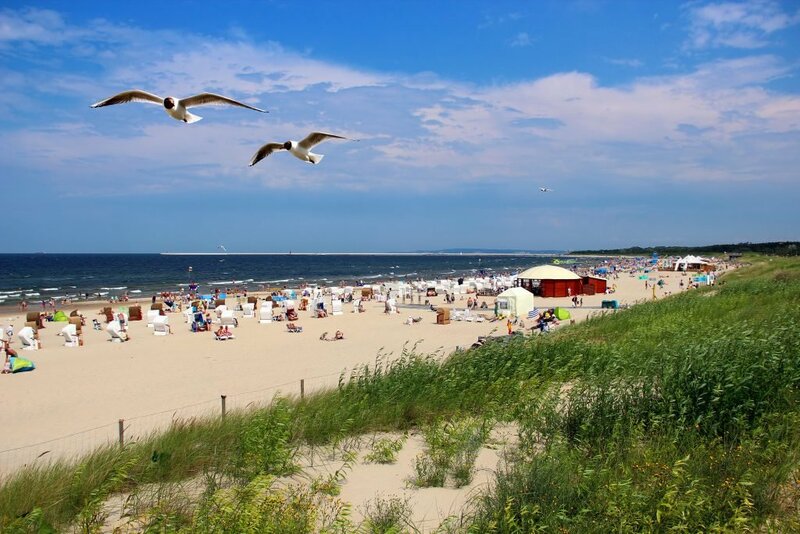 Statistically the sunniest place in all of Germany, a Usedom beach holiday is your best bet for a traditional beach holiday of sun, sea and sand. Hike and bike around the surrounding woodlands and explore its elaborate art deco villas. What the deuce? A beach in the city of Berlin you say? Yes, that's right. Located in the southwestern suburb of on the lake of the same name; take a trip out here and you'd never have guessed you were still in Germany's capital city. There's much lush forest to explore: cool calm water to swim in and even a Prussian palace to explore - as well as a few relics of Germany's darker history. If you want a Berlin holiday without the hustle and bustle, then book a beach hotel in Wannsee. 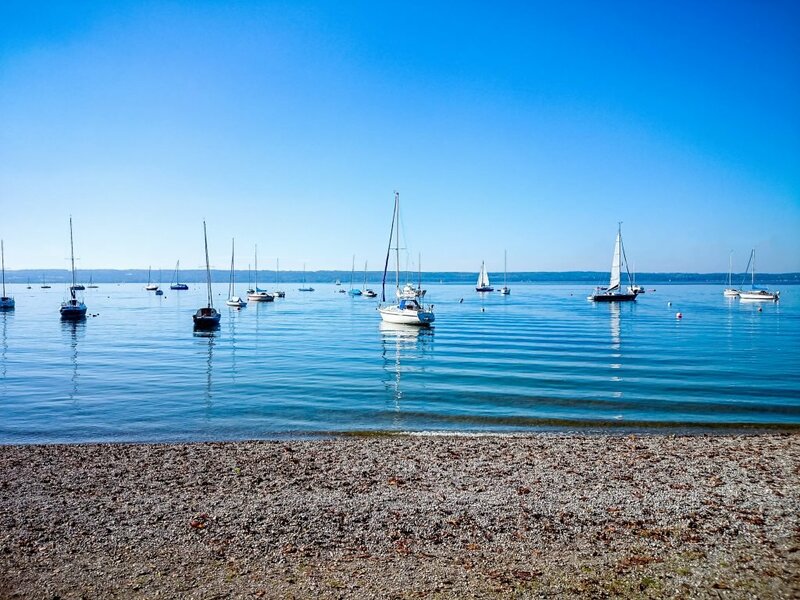 Ammersee is another spectacular Bavarian lakeside beach location offering the same kind of luscious forest surroundings for hiking and biking, and calm fresh water that you'll find around Chiemsee. Your best bet for a place to stay is a hotel in Herrsching am Ammersee, with its fairtytale mountaintop castle (it truly looks like a Disney castle). This former royal retreat is still a magnet for the rich and the famous. In fact, it still drags what remains of Europe's aristocracy - estateless as they may be now. Join the well-heeled for a spot of hiking and cycling, or perhaps take advantage of the countless water sports on offer: boating and windsurfing - only the best, naturally. Take a day trip for your hotel in Munich or book a local hotel overlooking Lake Starnberg itself.